For too many children in our community, a day of learning and laughter at the Children’s Festival is not possible due to illness, injury or physical challenges. Our Hospital Outreach Program brings the Festival experience to children receiving treatment at child-centred healthcare facilities. Children unable to leave their facilities can share in the Festival spirit with their families and benefit from the healing power of music, dance and laughter. Over the past ten years, the program has become firmly established as a highly anticipated, annual event at Canuck Place, B.C. Children’s Hospital and Sunny Hill Health Centre. At each facility, we offer a 30-minute performance by a Festival headline performer in additional to an afternoon of interacting with our professional face painters, circus performers and costumed characters. 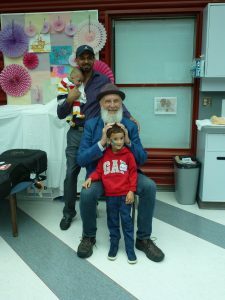 Canuck Place Children’s Hospices – provides care for terminally ill children at two facilities (Vancouver and Abbotsford). 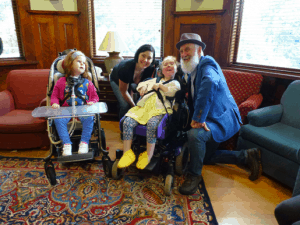 Canuck Place welcomes the VICF in their family lounge, offering a very special experience for the residents, those in respite care, their families and caregivers. The Hospital Outreach program is a vital component of our annual community outreach initiatives. The program provides a much-needed respite for the 300 or more children who can benefit from the Festival programming without having to leave their facilities or interrupt their treatment. The smiles of delight on the faces of children, who for even one hour, can forget about their illness or physical challenge, are a testament to the value of this program. Laughter often really is the best medicine.